On Saturday, I attended Bloggy Boot Camp here in San Diego. I was nervous, as I usually am when faced with a) a whole bunch of people I don’t know and b) a situation where I’m going to be expected to “talk myself up”. But I have to say, BBC was a really, really pleasant surprise in that it was EASY. Tiffany and Francesca from The SITS Girls have created a conference that makes it easy to walk in knowing NO ONE and end up leaving having talked to, at bare minimum, 25 other women. And it was shocking to me, after reading so much of how other conferences seem to work, how much everyone seemed to be totally ego free. No one put on airs that they were above talking to anyone else, and the only problem with meeting someone and chatting with them seemed to be finding the time for everyone. I promised in the title of this post that I’d give you a list of the top 8 things I learned, and I will. Right after I say this. If the Bloggy Boot Camp is ever in your neck of the woods, and you want to take your blog to the “next level”–whether that means strengthening your writing, strengthening your blog as a business, or just strengthening the community of blogs/bloggers you’re connected to–I recommend going. I came away with ideas and plans and thoughts…and a whole boatload of new connections. OK, on with the show. Eight Things I Learned at Bloggy Boot Camp. This isn’t going to recap all the info from the day–I’m not sure I could even if I tried, there was so much–but instead some of the key things I took away from the day. Big and small. Open & Honest. Tiffany Romero is pretty. But more than being pretty, she’s open, honest and not only willing but WANTS to share information with others. I respected her before yesterday for what she’s done for herself, but now I’m flat out amazed by her desire to help, really help, other bloggers succeed. Don’t go changing. Don’t change your Twitter avatar the day before a conference. I think I had the right idea–change it to my face so people could match my face with my online persona–I just had really crappy timing. I should have done it at least a week earlier, or AFTER the conference. I missed out on meeting a few people thanks to that move…don’t be like me. Layers. After all my worrying about what to wear, the most important thing ended up being WEAR LAYERS. Holy temperature regulation problems batman. It’s hard, I know, to regulate the temperature in a room with 130 bodies. I totally get it. I’m just glad I had both short sleeves and a jacket. Business cards. Business cards. Business cards.I am so so so so glad I rushed to get some business cards printed this week, because they were invaluable. I know of at least 3-4 people I met that didn’t have a card and I hope they get in touch with me because I honestly can’t remember their information! Fake it. I may never be great at walking into a room of people I don’t know, but, to steal a line from Tiffany and repurpose it, I can fake it till I make it. It may be exhausting, but I found out yesterday that I’m not alone–some bloggers I was SURE had it down pat admitted they were just as nervous. What’s your blog about? An elevator pitch about your blog is super important, not just for marketing purposes, but because it is REALLY hard when you have a table of 10 who all have to introduce themselves and their blogs in 3 minutes to spit out what the heck you do in less than 30 seconds without something like an elevator pitch in your back pocket. Desperado. One of my favorite quotes of the day: “Desperation leads to bad decisions.” That’s pretty much an amazing thing to remember for all of life. Nothing ventured, nothing gained. There are amazing things to be gained from stepping outside your comfort zone. As a writer, as a blogger, as a person. I gained more from Bloggy Boot Camp than just info on blogging. I would never have gotten that had I not sucked up my nerves and self-doubt about going. I have a hard time remembering that sometimes–that there are things to be gained from doing something hard, or uncomfortable. In fact, most of the best things in my life came from stepping outside my comfort zone. Like attending a conference full of fun, intelligent women who challenge me to be better. Like that. Great tips, I am encouraging my gf who started a blog a few months ago to go to some events like this and am definitely going to pass along this list to her. It was WELL worth it, in so many ways! She’ll have a blast! Sounds like fun. Wish I stayed up to date on these things. Didn’t even know they were having an event in San Diego. It would have been nice to meet other San Diegan bloggers. Next time. Thanks for the 8 tips. I love lists. I found it by chance a few months ago from SITS–it was great. For local blogs, have you heard of the SDMomfia? They do lots of local events–you should check them out to try and meet some locals if you haven’t. aw, now i wish i’d gone! it sounds like a great experience. Aw, I wish you had come too! I’d love to have met you! It was great to meet you too! And you’re totally right, the business cards helped break the ice a TON! Totally agree — I was really impressed with the conference. One of these days I will write a post about it, once I’m done sifting through vomit over here. I’m glad we got a chance to meet, and wish we would have had longer to talk, but I crashed and didn’t make the party. Next time, though. Not getting to chat with you more was the only real disappointment of the day for me, but I figured your time might be limited. I’m just glad you made it through your speaking without getting sick! At BlogHer though, don’t think I won’t monopolize more of your time! This is such a great post- thanks for taking the time to share your experience. But, an even bigger thank you for coming and sharing yourself, despite being nervous!! I had a great time and continue to stand in gratitude for the awesome energy we all shared. Thank YOU for creating such a great event! I’m so glad I got over my nerves (and that I got a ticket!) and went–I learned so much from you and all the amazing women who came! Completley agree with your takeaways! Great post, AMAZING conference! 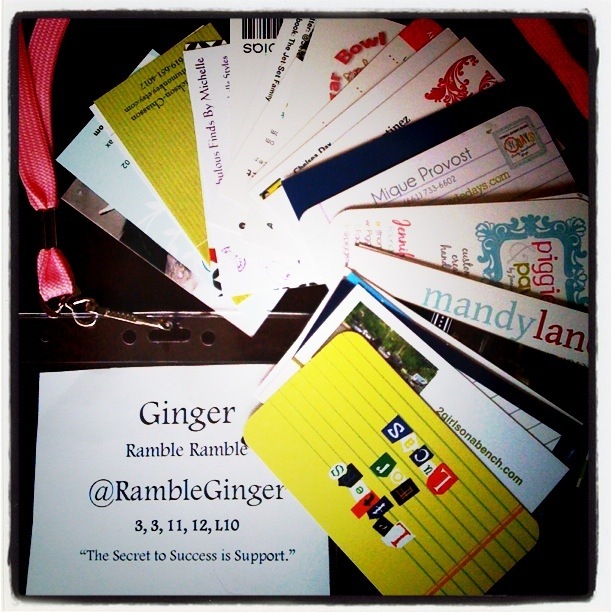 Bloggy Boot Camp is awesome! I’m glad I got to meet you and wish we had more time to chat but am looking forward to connecting via twitter and blogs! I kind of look at it like…BBC was the first date, and now Twitter and our blogs get to be the 2nd (and 3rd, and 4th) dates! Glad to hear your weekend was a success (didn’t doubt that it would be). These are great pointers, especially number 6. I will keep all of these things in mind when I go to Blogher in August (nervous already!!!!!!!!). Oh, I’ll be nervous before BlogHer, no doubt. One thing I should have included up there, that I’ll add here–I wish I had made some plans to meet specific people at specific spots/times so that 1)I didn’t miss people I knew I wanted to meet and 2) so that I might be able to have some connections before getting into the big room. Of course I say all this so that I can make a point of making sure WE meet at BlogHer! We will set a double-secret meeting time and spot, preferably with both of us wearing dark sunglasses. I’ll be the one wearing… You get the idea. We MUST meet at Blogher, and I MUST have someone to walk into a room of a thousand people with. Your top 8 things were perfect. Can’t believe how much information was thrown at us – I learned so much, well worth the price of admission. My head is still spinning from all the info (and all the ideas I have now!). I can’t wait to put it all into place–and connect more with the people I met this weekend. I was searching the web about bloggy boot camp BEFORE I paid my money. I’m pretty excited about attending and ready to take my blogging and vlogging to the next level. Thanks for the information. Keep it up! I finally bit the bullet and got a tix for BBC in Philly and, reading this, made me way more comfortable to know I’m headed to quite an experience with an amazing group of people. Thanks for the insight.